"The furnishings are very nice. Great internet. Real grass. Relaxing water fountain. Top of the line appliances and electronics. Laid back people. They will work with you on rent. You only have to attend three meetings, a week. The North Scottsdale fellowship, is right down the street. The house is located near all sorts of stores and outlets. Minutes away from the Paradise valley Mall. All around the nicest sober living, for the price around." "This sober house is the best one I been at it's clean and great environment great house manger and assistance manger, great group of people all respectful and house looks great and great back yard and everything u could ask for in a sober living pool table ping-pong table even a fountain in the back yard is cool." "Beautiful sober living home. 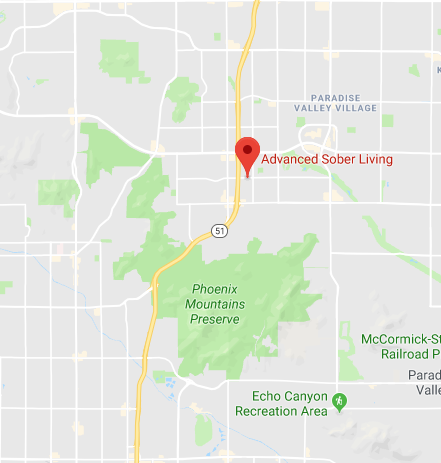 If you're looking for a respectable, mature, and up-scale sober living experience Advanced Sober Living is the place to go. It has been the perfect place for me to comfortably work and live my recovery." "Advance Sober living is honestly the best place to go to help an addiction or alcoholism they provide such wonderful care and they take so much time to provide resources for you that will help you through the struggle of trying to stop the addiction I can speak from experience by saying I enjoyed my stay you will definitely enjoy yours they are met with open arms and they will provide you with somebody who actually cares about you they take time to learn who you are what you like and in the end it helps a lot thank you advance you changed my life forever"
"Advance sober living is a clean and safe environment to grow spiritually. If you or a loved one are looking for Sober living. I highly recommend Advance Sober Living."